A Conservative councillor ‘threatened to resign’ from the party less than a week after he was elected due to not being given the position of mayor. Councillor Gul Nawaz appeared to have quit the party which would have seen the Tories lose their majority on the city council. But council leader and leader of the Conservative group, Cllr John Holdich, said he had misunderstood an email and that Cllr Nawaz was staying with the party he has represented at the Town Hall for the last 14 years. The issue, according to the council leader, was because Cllr Nawaz had believed he was going to be the next Mayor of Peterborough. Under council rules, the position of mayor is offered to the most senior sitting councillor who wants the position and has not held it before. Cllr David Sanders, who confirmed he will be the new mayor, has been a councillor since 1997, while Cllr Nawaz has been a councillor since 2002. Cllr Holdich said: “Before the election he had looked in pole position, but other people changed their mind. Feelings come into it as he firmly believed that he stood a chance. Cllr Nawaz, who was elected as deputy mayor in 2008, served a one-month jail term in 2002 for falsely claiming £3,000 of housing benefit from the council. He received the most votes in the local elections two weeks ago for Ravensthorpe Ward, making him one of 31 Conservative councillors on the 60-seat Peterborough City Council. Peterborough was the only council in the whole country to be gained by the Conservatives during the local elections, which prompted a visit by Prime Minister David Cameron to the Conservative Club in Broadway. 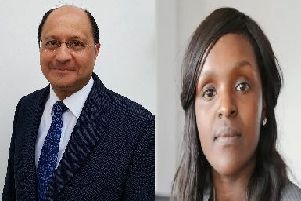 It had appeared that the joy was short-lived when Cllr Holdich and Peterborough MP Stewart Jackson both said that Cllr Nawaz had quit to sit as an independent, but the council leader was pleased to get the “misunderstanding” cleared up. Cllr Nawaz, who is not up for re-election for another four years, told the PT last Thursday he had not decided yet whether to quit the Tories to become an independent councillor and that he was still in talks with Cllr Holdich. On Monday, he said he had never resigned and that everything was now settled. He refused to answer further questions and said they should be directed to Cllr Holdich. Cllr Sanders will officially replace incumbent Cllr John Peach on Monday at the annual mayor-making ceremony at the Town Hall. The deputy mayor will also be elected.